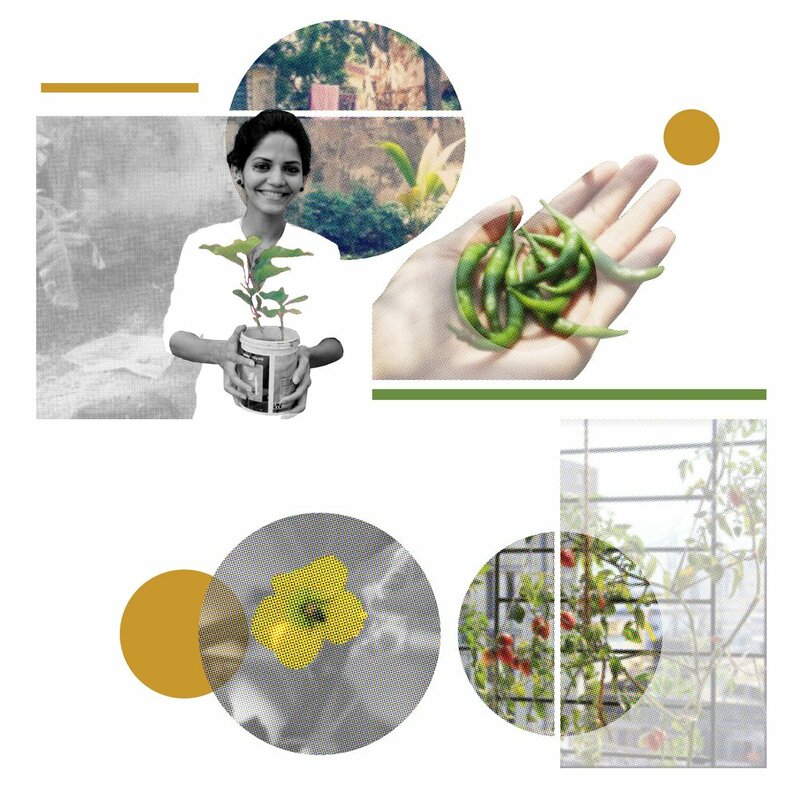 Aparna Verma spoke to enthusiastic planters and potters in the city about the trials and tribulations of gardening in small spaces. Art by Harshita Borah. Plants are multifunctional. As much as they add beauty and freshness to the surroundings, they are also therapeutic keeping your mind calm and refreshed. However where gardening is zen, city life is chaotic, while this makes the activity perfect for cities, it also makes it rather difficult to cultivate as a habit. We spoke to people in the city about their plants and the adventures of growing one. Resident of Dadar West since the past 60 years, Mrs Jonita talks about mosquitoes and a stellar idea of using buckets as pots because then people don’t steal them. Why did you start growing plants? Because I like them. I really like the mogra. Catholics offer roses at the church so I have that as well. All the current plants are from 3 years ago. My sister-in-law is the one who is actually very fond of plants. Through the years she has kept adding to the collection. When she comes back home from church she first takes a look at the plants and only then she attends to her chores. We also have hibiscus. Sometimes people steal the flowers. We scold them as and when they are busted but there’s not much we can do about it. Non- Catholics take the hibiscus for Ganapati, to them we don’t say anything. Jonita has used plastic buckets as pots for the plants. We asked her the reason behind this. Buckets because people steal the pots. Since the plants are on the road, unattended, you can’t even complain. Although I would like to have good pots. What are the problems that you have to face while growing the plants, almost on the road? Many things, but I still keep the plants because my sister-in-law and I both like them. There are rats that come and eat the plants or honey bees that enter the kitchen because they are hovering near the plants. Cars that pass the lane tend to hurt the parapet, destroying the plant’s branches. Sometimes there are a lot of mosquitoes. It gets too mushy in the rainy season because the water gets collected in the pots so you have to remove the excess. Now, because it is raining, I don’t water the plants at all. What advice would you give a rookie planter? Use the ‘Khat’ packet that the plant seller has and just begin to grow a sapling. You can also add brewed chai patti, dal water, rice water, egg shells, vegetable peels to your plant pot sometimes. Not regularly, not too much also. Plants add beauty to everything so if you like plants, do have one. Nikita Gundecha, is a resident of Thane, an active practitioner of sustainable living and a handicraft artist. How do you take care of your plants? Tell us about the process? Well, just like us, each one has its own needs. Some need to be pruned, some need more fertilizer, less water, more sun, more space. So, they need to be transplanted on time in adequate spaces (containers). I compost my kitchen waste at home which makes up as very good organic fertilizer for the plants. A simple homemade neem spray is used as a pesticide in case there's an infection. So, day to day care is mostly only watering and a little more effort once in 10 to 15 days. How do you feel with the plants around? Earlier in the evenings I used to spend time in my bedroom. Ever since I started growing veggies in the window sill of the living room, that changed. Most of my evenings are spent here now, just gazing at them. I feel at peace and filled with joy looking at them grow in form and colour every day. And they are a treat to the eyes, especially this season. What are the challenges a planter faces in a city like Bombay or the place you live at? Space is a huge issue. Most of us live in small apartments with hardly any space. I wish I had a nice balcony or maybe a small personal terrace. Fortunately, I have all east facing windows so there's enough sun but this direction thing could be a game changer. Then there's this new thing societies have started. They don't allow people to keep plants for the excess water that flows out spoils the paint of the building walls which I find is a very atrocious reason to stop doing something so beautiful. Saee recently moved to her own apartment in Bangalore and attempted to grow her very first plant. To the world’s dismay, it wasn’t a very successful activity for her although her attempts were dedicated enough to grow a garden. What are your rituals around raising the plants? I don’t have any rituals as such but while my tulsi was still alive, I would wish her good morning when I left for college and hello, how are you when I came back. I feel like someone’s there with me. Do you feel less capable that you are unable to raise and tend to this simple form of life? What do you feel is getting in the way of you having a healthy plant? My perpetually low self-esteem did not cope well with the loss of the tulsi. Also, the fact that I somehow thought the tulsi was like me did not make things better. I genuinely wanted her to grow and become taller and greener and happier but that didn’t happen. I think what got into the way was the negative energy that I was full of. I have been meaning to get a plant again, however I am scared I will kill another one. I can’t promise to exude good energy always but I think I can regulate my energies better now. I am learning to be more aware and more in-tune with my core, other living beings and the universe, in general. Maybe that will help when I buy my tulsi. Until then, I can still do my much-needed reading on how to raise plants! What made you want to start growing a plant in your home? I started growing plants after watching my grandfather do it. I had just settled in India after being born and brought up in Kuwait for 10 years. The prospect of growing plants which wouldn't perish in the heat seemed attractive! Are they decorative or religious or what meaning do they have in your home? We do have certain plants that are religious and/or decorative but most of them are vegetable and fruit plants we consume after growing them. My father and I take care of the vegetable and fruit plants whereas my mother and sister take care of the decorative and religious ones. I could write a book about the process! It all starts with sowing the seeds which needs to done in a scientific and systematic manner at the right time of the day. Then one has to observe and monitor water levels until the plant is ready to be transferred to the main pot where it will spend the rest of its life. The plant is then potted in a medium with a mixture of homemade fertilizers, red soil and some coco-peat. The gardener should watch out for possible insects which may cause harm to the plants and should also monitor the vegetables after they start forming. Have you changed since you started growing things on your own? I have changed significantly after I started gardening. Empathy is definitely one value I have learnt for other living beings by spending time or growing my own plants.